We don't choose where we are born. Most of the time, this fact does not limit our lives, yet Puerto Rican millennials are being deprived of their professional choices and forced to move away from their homes in order to forge a better future. I am an 18-year-old Puerto Rican studying Biology at the University of Puerto Rico. I am proud of this accomplishment, but I am filled with dread knowing that out of the 90 people I see in my Biology class, only half of us will graduate. 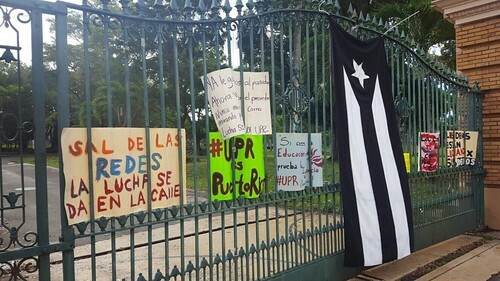 I cannot begin to describe the great frustration and anger one feels when the University of Puerto Rico, one of the Caribbean’s first universities, is failing its students. According to College Factual, “Only 17.2% of first-time/full-time students graduate from University of Puerto Rico - Rio Piedras on time (two or four years depending on the degree), but 47.0% do eventually graduate. This ranks the school among the worst in the country at graduating first-time/full-time students on time, but on average when it comes to the overall graduation rate.” These abysmal figures not only discourage many students from entering the institution, but also from staying on the island at all. Since 2005, over half of a million citizens have abandoned the island in search of a better economic standing, according to the latest U.S. Census. Around 80% of Puerto Rico’s municipalities have reported a decrease in population greater than 5%. This has caused a drastic effect on the education system and population of Puerto Rico. 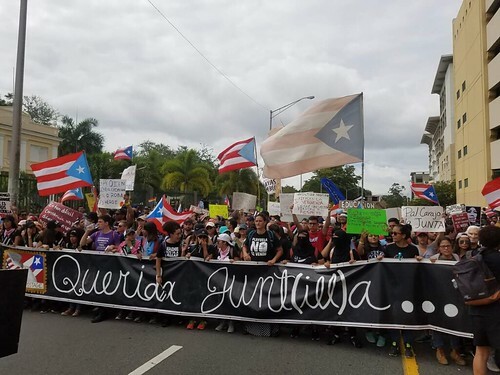 There are many reasons why young Puerto Ricans feel the need to leave their homeland, but the simplest explanation is a $70 billion national debt that the government was forced to default on in the beginning of 2016. On May 3rd, 2016, Puerto Rico declared bankruptcy, and the economic situation has only gotten worse since. In 1976, the United States added Puerto Rico to Internal Tax code Section 936. The provision would allow U.S. businesses to operate in Puerto Rico without having to pay any taxes to our local government. Despite these changes, our economy grew drastically for 20 years until the U.S. removed the clause in 2006. In doing so, it created a domino effect of companies leaving the island, which in turn made the unemployment rate skyrocket and set our economy into a downward spiral. Our unemployment is 11.5%, nearly three times that of the United States, and our poverty rate is 45%. In hopes of improving the situation, the United States has summoned the Council for Fiscal Control, also known as The Financial Oversight and Management Board for Puerto Rico. This board was created under the Puerto Rico Oversight, Management and Economic Stability Act of 2016. The Board consists of seven members appointed by the President of the United States and one ex officio member designated by the Governor of Puerto Rico. Its purpose is to identify new ways our government can restructure itself, make budget cuts, and make the overall system more stable in order for us to be able to pay our debt. To be clear, the Puerto Rican government did not ask for this board. It was imposed on us by the PROMESA act passed by the U.S. Congress on July 1st, 2016. Thanks to this act, this board of professionals now has the supreme power of deciding what our next steps as a territory must be. Our governor is allowed to appoint a member on this board, but both he and the representative have no voice or vote on matters discussed. This means we are essentially being forced to pay an imposed board over $10 million a year to rule over us, get rid of essential services such as healthcare and education, and make us pay off an overwhelming debt without consent or popular approval. Reasonable, right? During the board’s short reign over the island, it has already asked for $440 million from the public university system, a budget cut that will eventually result in the institution failing to fund schools like the University of Puerto Rico. They have already closed over 160 schools around the island, while the public hospitals and service offices, such as the Forensic Science Institute, are in peril. Recently, after the budget cut to the state university was announced, my campus (Rio Piedras) went on a 2-month strike. The gates were closed, and many protests were held. One of the movement’s demands was for the government to perform a debt audit since it has been long suspected that a great part of the accumulated debt was gained through illegal transactions. If this was true, it would implicate the resignations of many corrupt officials who still hold office. Unsurprisingly, these officials did not cooperate on this issue and chose to instead eliminate the government’s Commission for the Comprehensive Audit of the Public Credit. After they ended the Commission, they offered to redirect its funding to the University’s central fund, an act that most saw as a bribe for silence. The crisis has thoroughly affected many marginalized sectors of our population, especially poor youth. A recent ruling passed by the U.S. Congress, under the guise of PROMESA, lowered the minimum wage for all entry-level employees from $7.25 to $4.25 an hour. The implications of this change have been detrimental to Puerto Rican youth graduating from college and working for the first time; for example, an average student would have to work over 8 hours a day just to earn $35. This means that most students that do end up graduating have limited prospects unless they leave the island. Many of us here on the island remain fearful for our future. As the debt continues to loom over us, the stress has become tangible in the air. There are higher rates of depression and doctors’ offices are filled beyond capacity since the economic turmoil has driven many medical professionals out of the country. The news and radio have become beacons of sorrow, where the only topics discussed are the economic and social woes. This is not the tropical paradise Puerto Rico was sold as in the 1970's. Sometimes, it is hard to even consider this island home. Therefore, the next time you contemplate seeking that beautiful and tropical vacation, or the next time you are searching for an economy to invest in, please consider our island. Even the smallest efforts could finally start the tidal wave of help and aid we are desperately in need of. After all, just like the classic propaganda said, Puerto Rico is the vacation paradise.